Anyone who’s ever seen a Hong Kong chop-socky film will know that despite the spectacular martial arts and often spellbinding visuals, there’s often a strong B-movie undercurrent flowing within the spectacle. Similarly, underneath Blue Boy Entertainment’s frankly exhilarating display of hip-hop and martial arts fusion is a solid foundation of 70s kitsch and anime clichés. 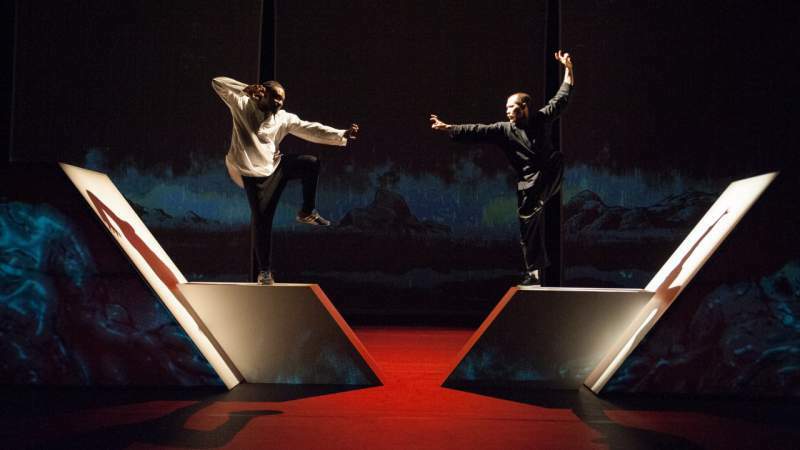 Set against a backdrop of luscious animated comic panels within the Northern Stage and backed by a soundtrack that melds traditional Japanese and Chinese music with hip-hop beats, the cast of The Five bring together their love of urban dance with martial arts in spellbinding fashion. The similarities between contemporary street dance and the fluidity of kung fu come to the fore within the expertly choreographed sequences that beautifully tell the age-old story of good versus evil. The real joy in The Five, though, is within the little touches. The use of pre-recorded dialogue gives the actors the opportunity to recreate some of the hilarious atrocious dubbing found in the 70s movies, while the blatant overacting and use of character tropes in-between dance segments lends the performance a dose of humour. These small flourishes make The Five as much of a love-letter to more child-friendly anime and 70s kung fu movies as it is to the power of dance. Thanks to its ambiguous ending, The Five also opens up the opportunity for a sequel. Based on the flawless nature of The Five, the Blue Boy crew can’t bring the next instalment along fast enough.